Hospice patients were left distressed and police were forced to stop traffic as out-of-control hunting dogs ran amok. The hounds caused chaos when they strayed from their trail onto a hospice’s grounds during the Braes of Derwent Hunt in County Durham. 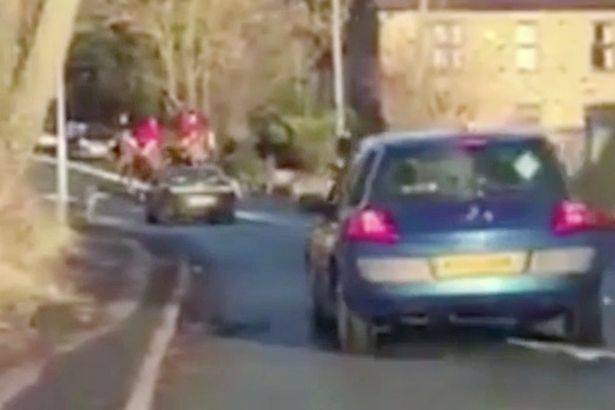 Organisers were forced to apologise to Willow Burn Hospice in Lanchester but claimed the dogs, which were filmed nearly being hit by traffic as they ran across roads, had been disrupted by anti-hunt saboteurs. But relatives of residents at the hospice criticised Monday’s bank holiday hunt on Facebook, while campaigners branded the intrusion “disgusting”. A spokesperson for the hospice told the Newcastle Chronicle : “We have been made aware of a recent hunt which made its way onto the land which is occupied by Willow Burn Hospice. Denise Knott wrote: “I cannot say how much this has upset me! I’ve never thought the hunts had any respect for anyone else, but this is really low. Durham Police have spoken to the hospice manager and said officers give advice to the hunt’s organisers. Bill Gascoigne, chairman and joint master of hunt, said: “It is true that six hounds did go through the property. “Our kennel huntsman went up to apologise to the staff at the hospice yesterday and there was no damage done. Video footage captured by anti-hunting groups on the day show chaotic scenes with hounds running into traffic, narrowly avoiding being hit. Mr Gascoigne blamed anti-hunt campaigners and said they the dogs were disrupted from their trail by saboteurs. He added that the hunt was a trail hunt with 75 riders and acted completely within the law. Since fox hunting was banned in 2005, most hunts involve dogs following an artificially laid scent followed by hunters on horseback who are challenged to keep up with the pack. “I do believe in hunting but we cannot hunt under the current law and we stick to the law,” he said. He claimed the debate around hunting had become a ‘class war’ but that hunting was becoming more popular with hundreds turning out at Corbridge to see them off on Boxing Day. “It’s a perceived class war. Anti-hunting campaign group Hunt Monitors, which shot the footage, said: “For the hunt to allow hounds to enter the grounds of a hospice where terminally ill people are resting is disgusting. “They have no respect private property and the hunts master should give a full apology to the staff and residence of the hospice with assurance that it will not happen again in future hunts in the area. Police have confirmed they had to stop traffic while the hunt participants rounded up the dogs. Inspector Keith Wardle said: “We are planning to speak to the hunt to offer some words of advice for next year.